This story builds on Cold-Forged Flame, but there’s no need to read that story to enjoy this one. See related articles on Tor.com. 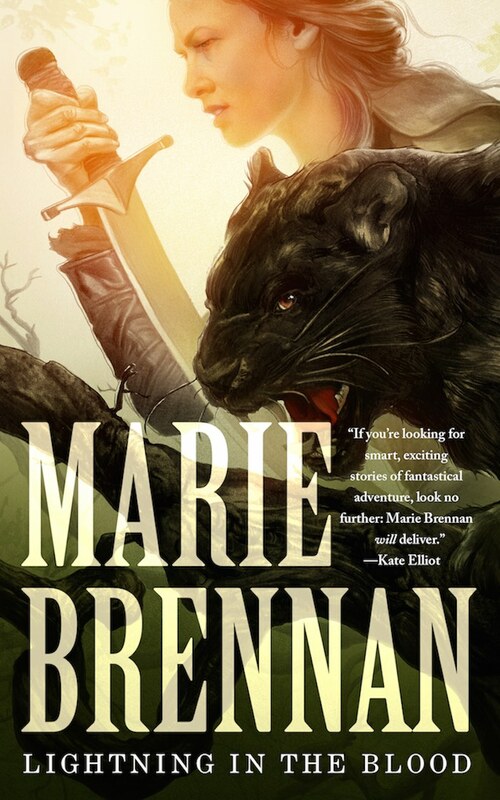 "Lightning in the Blood," by Marie Brennan [bio] (edited by Miriam Weinberg), published on April 25, 2017 by Tor.com. Pro: There are several intersecting plot threads here. First, Ree wants to be with Aadet. Maybe not romantically, but she definitely wants his company, and as the story opens, that’s her main goal. Second, she wants to learn more about her past, especially the rest of her name, and particularly to learn whatever the Lhian took from her. She adds the goals of helping the Korenat people she met, and finally of defeating Sihpo Teglane. Aadet clearly wants to be with Ree, having tired of politics, Mevreš wants to enlist Ree’s help with the Korenat as a whole, and Enkettsivaane wants to be taken seriously as king, which means no threats to his authority from Archons. By the end of the story, Ree and Aadat are going on an adventure together based on things Mevreš told her, Ree has learned more of her name (Ree Varekai), it’s pretty obvious the Lhian took away her memories of her people, the Korenat are settled peacefully in Solaike, and, of course, Sihpo has been defeated. And the king is happy too. Con: The biggest problem is that even with all those plot elements, it feels like this novella was merely setting up the next one. None of the conflicts is particularly difficult, and the story has almost zero tension in it. The single most emotional moment in the whole thing is when Mevreš calls her “Ree Varekai” and we realize she’s learned more of her name. The characters are fairly weak. Outside their plot threads, we know almost nothing about them. This contributes to the lack of tension, as we wouldn’t miss any of them except for Ree. What I found odd about this one was the decision to do a timeskip from the first story that included a big chunk of backstory - instead of taking the advantage of being book #2 and getting straight into the story, it had to revert to "as you know Bob" mode again. I didn't dislike it, especially as there were some interesting new elements introduced, but I felt like I was back to square 1.